NMR spectra are unique, well-resolved, analytically tractable and often highly predictable for small molecules. Thus, in organic chemistry practice, NMR analysis is used to confirm the identity of a substance. Different functional groups are obviously distinguishable, and identical functional groups with differing neighboring substituents still give distinguishable signals. NMR has largely replaced traditional wet chemistry tests such as color reagents or typical chromatography for identification. A disadvantage is that a relatively large amount, 2–50 mg, of a purified substance is required, although it may be recovered through a workup. Preferably, the sample should be dissolved in a solvent, because NMR analysis of solids requires a dedicated MAS machine and may not give equally well-resolved spectra. The timescale of NMR is relatively long, and thus it is not suitable for observing fast phenomena, producing only an averaged spectrum. Although large amounts of impurities do show on an NMR spectrum, better methods exist for detecting impurities, as NMR is inherently not very sensitive - though at higher frequencies, sensitivity narrows. 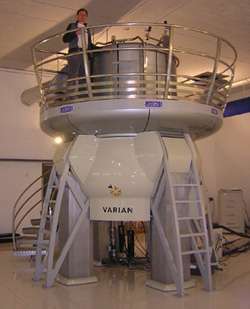 NMR spectrometers are relatively expensive; universities usually have them, but they are less common in private companies. Modern NMR spectrometers have a very strong, large and expensive liquid helium-cooled superconducting magnet, because resolution directly depends on magnetic field strength. Less expensive machines using permanent magnets and lower resolution are also available, which still give sufficient performance for certain application such as reaction monitoring and quick checking of samples. There are even benchtop NMR spectrometers. When placed in a magnetic field, NMR active nuclei (such as 1H or 13C) absorb electromagnetic radiation at a frequency characteristic of the isotope. The resonant frequency, energy of the absorption, and the intensity of the signal are proportional to the strength of the magnetic field. For example, in a 21 Tesla magnetic field, protons resonate at 900 MHz. It is common to refer to a 21 T magnet as a 900 MHz magnet, although different nuclei resonate at a different frequency at this field strength in proportion to their nuclear magnetic moments. A NMR spectrometer typically consists of a spinning sample-holder inside a very strong magnet, a radio-frequency emitter and a receiver with a probe (an antenna assembly) that goes inside the magnet to surround the sample, optionally gradient coils for diffusion measurements and electronics to control the system. Spinning the sample is necessary to average out diffusional motion. Whereas, measurements of diffusion constants (diffusion ordered spectroscopy or DOSY) are done the sample stationary and spinning off, and flow cells can be used for online analysis of process flows. The vast majority of nuclei in a solution would belong to the solvent, and most regular solvents are hydrocarbons and would contain NMR-reactive protons. Thus, deuterium (hydrogen-2) is substituted (99+%). The most used deuterated solvent is deuterochloroform (CDCl3), although deuterium oxide (D2O) and deuterated DMSO (DMSO-d6) are used for hydrophilic analytes. The chemical shifts are slightly different in different solvents, depending on electronic solvation effects. NMR spectra are often calibrated against the known solvent residual proton peak instead of added tetramethylsilane. To detect the very small frequency shifts due to nuclear magnetic resonance, the applied magnetic field must be constant throughout the sample volume. High resolution NMR spectrometers use shims to adjust the homogeneity of the magnetic field to parts per billion (ppb) in a volume of a few cubic centimeters. In order to detect and compensate for inhomogeneity and drift in the magnetic field, the spectrometer maintains a "lock" on the solvent deuterium frequency with a separate lock unit. The operator usually has to optimize the shim parameters manually to obtain the best possible intensity and prevent artifacts. Upon excitation of the sample with radio frequency (60–1000 MHz) pulse, a nuclear magnetic resonance response - a free induction decay (FID) - is obtained. It is a very weak signal, and requires sensitive radio receivers to pick up. A Fourier transform is done to extract the frequency-domain spectrum from the raw time-domain FID. A spectrum from a single FID has a low signal-to-noise ratio, but fortunately it improves readily with averaging of repeated acquisitions. Good 1H NMR spectra can be acquired with 16 repeats, which takes only minutes. However, for heavier elements than hydrogen, the relaxation time is rather long, e.g. around 8 seconds for 13C. Thus, acquisition of quantitative heavy-element spectra can be time-consuming, taking tens of minutes to hours. If the second excitation pulse is sent prematurely before the relaxation is complete, the average magnetization vector still points in a nonparallel direction, giving suboptimal absorption and emission of the pulse. In practice, the peak areas are then not proportional to the stoichiometry; only the presence, but not the amount of functional groups is possible to discern. An invension recovery experiment can be done to determine the relaxation time and thus the required delay between pulses. A 180° pulse, an adjustable delay, and a 90° pulse is transmitted. When the 90° pulse exactly cancels out the signal, the delay corresponds to the time needed for 90° of relaxation. Inversion recovery is worthwhile for quantitive 13C, 2D and other time-consuming experiments. However given that the location of different NMR signals is dependent on the external magnetic field strength and the reference frequency, the signals are usually reported relative to a reference signal, usually that of TMS (tetramethylsilane). Additionally, since the distribution of NMR signals is field dependent, these frequencies are divided by the spectrometer frequency. However, since we are dividing Hz by MHz, the resulting number would be too small, and thus it is multiplied by a million. This operation therefore gives a locator number called the "chemical shift" with units of parts per million. In general, chemical shifts for protons are highly predictable since the shifts are primarily determined by simpler shielding effects (electron density), but the chemical shifts for many heavier nuclei are more strongly influenced by other factors including excited states ("paramagnetic" contribution to shielding tensor). The shape and area of peaks are indicators of chemical structure too. In the example above—the proton spectrum of ethanol—the CH3 peak has three times the area as the OH peak. Similarly the CH2 peak would be twice the area of the OH peak but only 2/3 the area of the CH3 peak. For more details on this topic, see Magnetic inequivalence. Correlation spectroscopy is one of several types of two-dimensional nuclear magnetic resonance (NMR) spectroscopy or 2D-NMR. This type of NMR experiment is best known by its acronym, COSY. Other types of two-dimensional NMR include J-spectroscopy, exchange spectroscopy (EXSY), Nuclear Overhauser effect spectroscopy (NOESY), total correlation spectroscopy (TOCSY) and heteronuclear correlation experiments, such as HSQC, HMQC, and HMBC. In correlation spectroscopy, emission is centered on an the peak of an individual nucleus; if its magnetic field is correlated with another nucleus by through-bond (COSY, HSQC, etc.) or through-space (NOE) coupling, a response can also be detected on the frequency of the correlated nucleus. Two-dimensional NMR spectra provide more information about a molecule than one-dimensional NMR spectra and are especially useful in determining the structure of a molecule, particularly for molecules that are too complicated to work with using one-dimensional NMR. The first two-dimensional experiment, COSY, was proposed by Jean Jeener, a professor at Université Libre de Bruxelles, in 1971. This experiment was later implemented by Walter P. Aue, Enrico Bartholdi and Richard R. Ernst, who published their work in 1976. Much of the innovation within NMR spectroscopy has been within the field of protein NMR spectroscopy, an important technique in structural biology. A common goal of these investigations is to obtain high resolution 3-dimensional structures of the protein, similar to what can be achieved by X-ray crystallography. In contrast to X-ray crystallography, NMR spectroscopy is usually limited to proteins smaller than 35 kDa, although larger structures have been solved. NMR spectroscopy is often the only way to obtain high resolution information on partially or wholly intrinsically unstructured proteins. It is now a common tool for the determination of Conformation Activity Relationships where the structure before and after interaction with, for example, a drug candidate is compared to its known biochemical activity. Proteins are orders of magnitude larger than the small organic molecules discussed earlier in this article, but the basic NMR techniques and some NMR theory also applies. Because of the much higher number of atoms present in a protein molecule in comparison with a small organic compound, the basic 1D spectra become crowded with overlapping signals to an extent where direct spectral analysis becomes untenable. Therefore, multidimensional (2, 3 or 4D) experiments have been devised to deal with this problem. To facilitate these experiments, it is desirable to isotopically label the protein with 13C and 15N because the predominant naturally occurring isotope 12C is not NMR-active and the nuclear quadrupole moment of the predominant naturally occurring 14N isotope prevents high resolution information from being obtained from this nitrogen isotope. The most important method used for structure determination of proteins utilizes NOE experiments to measure distances between pairs of atoms within the molecule. Subsequently, the distances obtained are used to generate a 3D structure of the molecule by solving a distance geometry problem. NMR can also be used to obtain information on the dynamics and conformational flexibility of different regions of a protein. Carbohydrate NMR spectroscopy addresses questions on the structure and conformation of carbohydrates. ↑ "Background and Theory Page of Nuclear Magnetic Resonance Facility". Mark Wainwright Analytical Centre - University of Southern Wales Sydney. 9 December 2011. Retrieved 9 February 2014. ↑ Shah, N; Sattar, A; Benanti, M; Hollander, S; Cheuck, L (January 2006). "Magnetic resonance spectroscopy as an imaging tool for cancer: a review of the literature.". The Journal of the American Osteopathic Association. 106 (1): 23–27. PMID 16428685. ↑ Pople, J.A. ; Bernstein, H. J.; Schneider, W. G. (1957). "The Analysis of Nuclear Magnetic Resonanace Spectra". Can J. Chem. 35: 65–81. ↑ Fürtig, Boris; Richter, Christian; Wöhnert, Jens; Schwalbe, Harald (2003). "NMR Spectroscopy of RNA". ChemBioChem. 4 (10): 936–62. doi:10.1002/cbic.200300700. PMID 14523911. ↑ Addess, Kenneth J.; Feigon, Juli (1996). "Introduction to 1H NMR Spectroscopy of DNA". In Hecht, Sidney M. Bioorganic Chemistry: Nucleic Acids. New York: Oxford University Press. ISBN 0-19-508467-5. 1 2 Wemmer, David (2000). "Chapter 5: Structure and Dynamics by NMR". In Bloomfield, Victor A.; Crothers, Donald M.; Tinoco, Ignacio. Nucleic acids: Structures, Properties, and Functions. Sausalito, California: University Science Books. ISBN 0-935702-49-0.